Laying Down The Foundations: Pai tū, pai hinga! "But I have so much to do, when will I get the time back?" "I'm already using Te Reo in the hub!" "I hope I don't have to say anything in front of anyone - my pronunciation is terrible!" Notice how these thoughts go to self doubt and time constraints - I didn't and it wasn't until this week that I realised this. The sessions so far have been pretty insightful more on how much I still have to learn about using Te Reo in my practice. I reflected on how I felt hard done with the Te Reo course at university which gave me a great perspective of the bicultural nature of our education system but did not set me up for success with any practical application for my practice. Rosalie shared with us this video where Janelle Riki-Waaka speaks of the schools of Aotearoa. 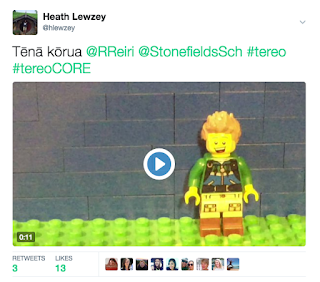 It is a great video to watch if you are reflecting on how you are using Te Reo as I came away from watching this with a new sense of purpose on ensuring that I am trying my best to show our school as one that is of Aotearoa. The first thing I did do after our initial session was to learn how to add tohutō (macrons) to the vowels to ensure that if I am using Te Reo in emails or planning that I was reflecting the correct use. These sessions have also given me more confidence with teaching - the learners in our hub have decided that they want to share some Te Reo with the rest of the junior school at our upcoming assembly. Normally I would be quite nervous with helping the learners practice and ensuring that we we saying words properly however we shared with them how the teachers were all learning Te Reo and our practices now seem more natural. I feel more confident to help learners with pronunciation and am looking forward to seeing the hub perform this week. Thanks for sharing this! I did a full immersion course last year, but coming back into a mainstream class has been challenging for me - figuring out how Te Reo fits into the mainstream setting. How lucky you are to work with Rosalie and to have that support at your school. I look forward to seeing other resources and experiences you have. All the best in your journey! Kaua e mate wheke, mate ururoa! Don't give up! Tēnā rawa atu koe Kyla, onwards and upwards hopefully! Look forward to hearing how you are going with how you are incorporating your knowledge back into your classroom!